The status of an animal is not some inborn property, like the colour of its hairs or the way its body is shaped. It is a socially and culturally assigned value that can be given and taken away. We, humans, as a cultural group determine the status of an animal. Status is also a gradual phenomenon, one can assign high or low status to an animal. People, animals and objects can be assigned more or less value in a gradual manner. At the top of the status series one can sometimes find a sudden transition. When a pop star, a racing horse or an old monumental house slowly grow in status over time and crosses some threshold value, they can receive an untouchable super status. Finally status is a relative concept. I assign a different status to a primary school teacher than one of his students does. Researchers assign a lower status to a laboratory rabbit than to a rabbit kept as a pet. The sociologist notices the behavioural changes when people of different status meet each other. The ethologist sees the differences in status amongst herd animals like wolves or humans, that cause dominating or submissive behaviour. When people of similar status meet, however, there are no behavioural changes. 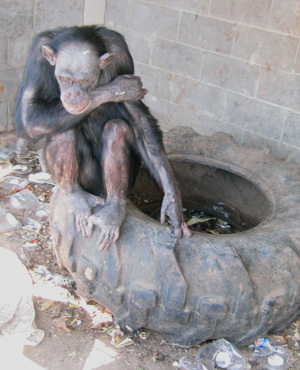 The realisation that status is not some absolute measure but an assigned, culturally determined phenomenon, implies for people in a subculture that assigns a "low" value to animals (like industrial farmers or animal experimenters) that they have as few "hard" arguments as the people of the subculture who assign a higher value to animals (like animal protectors). As long as these two subcultures continue to live strictly separated, each meeting will lead to a culture shock and consequently lead to ignorance behaviour. One will keep his or her mouth closed during the next birthday party or outside the laboratory. Policy makers were wondering if the status of an animal can be improved, e.g. in biotechnology. The interesting aspect of status is that it is a dynamic concept. The status of a top researcher can fall down quickly when unethical behavior takes place like fraud. The other way around, a biotechnologically changed animal, e.g. bull Herman (first genetically manipulated bull) became so popular that the government eventually decided he cannot be slaughtered as an ordinary bull. Eventually he passed away in April 2004. The following examples may help understand this. There are plenty of cultures where a certain animal has a high or low status "obviously and since many many years." Examples are the holy cow in India, holy cats and crocodiles in ancient Egypt, animals for sacrifice purposes (e.g. old Aztec and Mediterranean culture) and the spider Anantie in Africa (a clever spider that always outsmarts the tiger). But there are also "parias" amongst cultural images of animals: rats, spiders in Europe, pigs in Islam, insects that potentially carry or spread diseases or that damage agricultural crops. Each of us is born in such a cultural framework, and one "receives" the status of each animal species via a.o. fairytales, legends, cartoons and comics, children's books, documentaries and computer games. Against this background "value," each person will develop on top his own variations depending on his or her environment (hearsay from family members, personal experiences). One's own pet will get a higher status then other people's pets. Bonding implies a "contract" that creates mutual obligations towards one another. Some animals cannot be tamed. It is not in their species specific behaviour to exchange their freedom for the protection and caring offered by humans. Some species have offered their freedom, however, for a bond with humans. In this regard domestication is a process of mutual obligations between man and animal. Some biotechnologists nowadays utter that genetic modification is nothing new, since "we have been domesticating animals for centuries." Apart from the fake reasoning that something would not be morally "bad" because we are doing or have been doing it already for centuries (this definitely does not hold for e.g. slave trade and discrimination) shows little insight into the evolutionary meaning of the process of domestication for the status of humans. Anthropologists who are trying to understand the evolution of the earliest humans, are studying in the present remote tribes and peoples in their transition from hunting-based societies to farming societies. The condition that needs to be fulfilled to create a civilization, a culture, with writing and trade, is the domestication of animals. The statements of the above mentioned biotechnologists do not take the mutualness of the co-evolution into account. "What does that mean - to tame?" The fox replied: "It means 'to bond with." "Exactly," said the fox, "For me, now you are just a little boy, not different from those hundred thousand of other little boys. I do not need you, and you, from your side, do not need me. For you I am nothing but a fox, just like hundred thousands of other foxes. But if you would tame me, we would need each other. For me you would be unique in this world. For you I will be unique..."
City culture stimulates youth to create such bonds. Cartoons and comics, nature documentaries, summer camps and public farms (where animals can be freely touched by children) facilitate such bonds. And for such reasons many people study biology. And then, paradoxically, start to perform experiments on animals. Then we are not cosily chatting about Mickey Mouse anymore. Then a laboratory cat is something completely different from a house cat. The experimental animals also do not die to be buried with a small ceremony in an old shoe box in the yard, no, they are 'sacrificed' and taken away for "destruction." It seems too absurd for words: critical students, the intelligentia of the future. And exactly they are involved in experiments on animals, as if they agree with the mantram "experimental animals are different and they are born for research." The anthropologist Arluke has studied this strange motivation of the human-animal bond. The altar of ancient times is now a desk with photographs of mice, screensavers with mice and stuffed toy mice. Here the high priest in training sacrifices animals in the name of science, in order to obtain (they hope) success and health. The anonymous mice are cleared out at given times, preferable by assistant personnel as animal caretakers and biotechnical staff. The innocence and faithful glance of the animal does not need to cross the eyes of the researcher anymore. There are also animals to which we do not assign historical value and with which we do not have a direct bond through personal experience. It is remarkable, however, that having knowledge on the life of an animal can increase its status. In the 1970s it was investigated if offering lessons in Nature Education at primary schools would increase the status of animals that generally score low. Indeed it is possible to increase the status of an animal by teaching about them and/or providing information, e.g. spiders. Also at this point animal experimenters are in a strange position. Their research generates a lot of knowledge about the animal they use. The relevant research literature and one's own results accumulate in the biologist's mind. The more one becomes aware of the complexity of the animal, the more the researcher is tempted to use the animal "carefully." The animals are growing in status. This is less true for molecular biologists, however. Their focus is more on detailed processes within cells, and they are more prone to respecting cellular processes. On the other hand they are less often using e.g. genetically modified mice. Their breeding is arranged by the animal caretakers and the researcher often does not see anything from the animal but a set of tissues through a microscope. It is also less true for researchers using animals for experiments in the medical sciences. For them, humans, in particular the ill human, is the point of reference. Animals only have a value as long as they are capable of mimicking a human property (mice can be genetically engineered to mimic a human disease and thus serve as an animal model for that disease). Increasing knowledge on the lethal forms of e.g. colon cancer (through a mouse genetically altered with human cancer genes) generates more respect for the mechanisms of the human cancer genes. The status of the mouse does not increase very much here, to the contrary, its status may actually decrease since mice are only the carriers of the studied human genes. Interestingly, the age of an animal may also affect its status. For some intuitive reason that is difficult to rationalize, doing harm to a puppy or newborn animals seems worse than to an adult of the same species (suppose you must choose). A possible explanation is the consideration that an adult animal has had more life time and therefore has more been able to "get something out of it." Rather one can say that the adult animal has been around doing what it does for some time already (e.g. in the case of a wild animal, fulfilling its natural needs and behaviors), but a puppy is just at the start of doing that. Killing a puppy might feel in this regard as taking away more of something than when killing an adult animal. One may even philosophize about a difference between pups that are basically helpless at birth (humans, mice, rats) as compared to pups that are almost independent at birth (guinea pigs, most livestock). As soon as we hear that there are only a few individuals of a species left, the status of the remaining individuals rockets sky high. A variation of this phenomenon can be seen in the difference in status between originals and copies of something. Copies of masterpieces of art are attributed less status then the original masterpiece. The number of something seems to be an important factor for status. Threatened species generally receive a higher status then non-threatened species. Animals that reproduce a lot, that have several litters per year with a high number of offspring, like mice and rats, are seen as infestation animals. It is allowed to hunt such animals and their numbers seem to be hardly influenced by it. This is quite different for animals that only get one young at a later age (lions, elephants, orang-utan, whales). The death of a parent or a child can significantly endanger the survival of the group as a whole. The World Wildlife Fund has a lot of attention for such vulnerable species. The (Dutch) Committee Biotechnology of Animals once advised a scientist to split his approval request up into two approval requests. It was about the development of therapeutic substances in the udder of bovines (so that the substance can be harvested by milking the cow). Of the split application version, one should deal with transgenic mice with the desired substance in their milk, and the 2nd one as the 1st one but dealing with bovines instead of mice. According to the scientists this is an absurd idea, because the experiment with the mice is a pro-fase of the experiment with the cows anyway. The importance of the mouse experiment is almost zero if there were no bovine experiment to follow up. The experiment with the bovines can only be justified if the mouse experiment is successful. The committee knows, however, from the case of bull Herman, that cows have a higher status in The Netherlands than do mice. In their assignment to consider the anticipated experiment for "ethical aspects" and the "clarification of the moral status of the animal," one finds the splitting up into two separate requests logical. The higher status of the cow was shown in the committee's approval to allow for the making transgenic of the mice but for the moment not to do this for the cows. We have entered the century of informatics. The knowledge generated by scientists, biologists, increases daily. This knowledge is distributed quicker then 20 years ago via popular science magazines (New Scientist, Science, National Geographic, Scientific American), scientific appendices to newspapers, television (e.g. Discovery Channel) and last but not least internet to the interested people and a new generation of students and scientists. If there are still animals from which there exists no fascinating life description, it will be generated in the next fifty years. This trend teaches us that accumulating knowledge will increase the status of all animals. While it was completely accepted fifty years ago to combat malaria in Africa with DDT, nowadays the mere suggestion will be considered simplistic thinking. Of course, DDT kills the mosquitos, that are the carriers of the malaria parasite. Nowadays we know so much about the network in which mosquito, parasite, human, resistance and immune system modulate each other, that a linear cause and effect reasoning is considered an outdated concept. The philosophical consequence of this network approach is, however, that the status of the most tiniest animals in this world is increased to be an essential part in the survival of the famous top scorers in the animal kingdom. For example, the role of krill around the polar seas in the survival of whales. In The Netherlands and Europe there is continuing tendency of urbanization expected for at least the coming 50 years. What is left of nature shall become more and more under the control of natural parks. This tendency also occurs in South America and Africa. The ways of animals shall be monitored using satellites and "Wild Life Rangers" shall guard ecological networks at a local level. Then there will not be many "wild" animals left. There may be a time when all animals in nature are used to the human being driving and walking around them, filming. The category "wild" does not exist anymore. One can only speak in a virtual manner about animals, that if humans had not noted them and protected them, have the potency to become real wild animals. That, however, is a fate that will not be in store for whatever animal. All animals are prone to becoming "kept" animals sooner or later. The concept of "kept" animal plays a role in policy issues. The (Dutch) Flora & Fauna Act contains rules for the treatment of wild plants and animals. The (Dutch) Health and Welfare of Animals Act contains rules for all kept animals. The former legislation will become increasingly empty over the coming years. Even the migratory birds in Europe can be considered as protected animals that fly along from reserve to reserve. Already bird watchers have a bond with "their" re-caught birds after they had been caught only last year as a "wild" bird. The thought that a Frenchman is allowed to shoot one of these birds from the sky in order to prepare them for a delicious meal, makes the bird watcher's blood boil. In this regard, the bond between bird watcher and bird leads to the same emotions you would experience when your pet was hit by some nasty person. Perhaps you would like to oppose that there is a difference between the personal bond with a pet and a general feeling of responsibility for the survival of animals. Morally speaking, this difference does not exist, however. In both cases I am upset, because the bond, in the meaning of "you meaning something for me in my life (and vice versa)," was interfered with by a stranger. In both cases there is no death of a bird in France, or a cat in Rotterdam. No, in either case it is my bird and my cat. In the future, all animals will be, for everybody, my-animals. Another prediction for this new century is that the number of endangered species will grow. This also contributes to the trend that all animals eventually shall reach a high status. Considering the demographic developments in Europe it is inevitable that the status of animals will continue to increase, in particular since our knowledge about animals and their ecological networks is increasing. At the same time biodiversity and biomass will decrease. The remaining species will be put more and more under direct supervision and control of humans, resulting in an integral function and responsibility of man for the future as animal protector. In The Netherlands there are two sectors however, in which the numbers of animals are kept high via breeding programmes, where everything possible is done not to bond with the animals, and where compromising knowledge production about the human-specific needs are answered with removing such desires (select out) (chickens, minks) via breeding programmes or genetic modification. In short, where all variables point at a low status, i.e. the booming business of biotechnology and bio-industry. And this while the government officially strives for sustainable agriculture, and for reduction, refinement and replacement of animal experiments. Obviously, the economic forces in the fields mentioned are large. But that is at best an explanation, not a justification. There are two developments that may reduce the use of animals in experiments. In the close future, the emphasis on refinement of animal experimental protocols in biotechnology shall lead to new types of animal experiments and experimental animals. With the result that most of the animals need no longer even be aware they are participating in an actual experiment. Subtle changes in the mouse genome gives a lot of information on the non-pathological dynamics of physiological processes. The extreme pathologies often seen in classic animal experiments will not be so necessary anymore, since our knowledge about molecular processes steadily increases. The research questions shall be more and more at the molecular level and for this there is less and less need for symptoms that cause suffering in the animals. Eventually it is not unlikely that animal experiments become redundant because molecular diagnoses, direct therapies and patient monitoring become possible. The risk for suffering, from which test persons (humans) are protected through the Treaty of Helsinki will then be strongly reduced. One could discuss the real added value and risks of animal experiments and human experiments in the transition to clinical trials. Animals and patients can profit if the superfluous part of the currently obligatory animal experiments can be skipped. It is to be expected that the biotechnological revolution will break out from the laboratory and change agriculture profoundly. And with time, also pets, "wild" animals and even humans will become modified. Of course, some researchers and farmers tend to refer to traditional values and historical claims (right for hunting, fur, right to inheritance of farms, fishing with life baits, cancer research with mice). Nevertheless, these people would be wise to anticipate the increasing status of animals in society as a whole. It is after all the young researchers from now that will be called for responsibilities in some 50 years. Researchers and management from now do not score very high when it comes to transparency regarding welfare issues of transgenic animals. One prefers to invest in research instead of welfare monitoring and animal care. This can be understood from a short term perspective. In the long run, however, it will be the grandchildren asking grandma and grandpa about their ways of dealing with animals. And at that future moment the ideas about "correct" animal treatment will be guaranteed much higher then now.